A tornado wrecks the Gregory camp. During the storm the native bearers desert taking most of the supplies with them. Larson also vanishes during the tempest and Wolf volunteers to search for him. The German, however, hastens back along the trail to talk with Atan Thone to whose camp the deserting blacks have attached themselves. Wounded Larson returns to tell Tarzan of his capture and subsequent escape from the bearers. Shortly after Larson returns, Wolf stalks into camp and the little group prepares to settle down for the night. At the distant sound of war drums, Tarzan leaps to his feet. The throbbing maddening rhythm of the drums rises higher and higher. Suddenly, from all sides of the clearing a screaming horde of crazed blacks charges furiously. Tarzan organizes the party’s defences and races leaps into the trees. On his way past Wolf, a paper drops from the ape-man’s leopard skin loincloth. Wolf slyly picks it up, pockets it, and walks toward the attackers. The whites recognize the attackers as being their traitorous bearers led by Lal Taask. The oriental orders the surrounded party to surrender but Tarzan leaps onto him from the trees above and kills the man with his own knife. Soon after, a spear kills Gregory. Recognizing that the women are in danger, Tarzan agrees with Larson’s plan to surrender. D’Arnot comforts Helen and expresses his love for her. Atan Thome appears and orders them to cooperate and to turn over the map. When Tarzan realizes that the map is missing, Magra who had seen it fall from Tarzan’s loincloth, tells Thone that Wolf has it. Thone finds the map on Wolf and is convinced that the German has been hiding it all along. 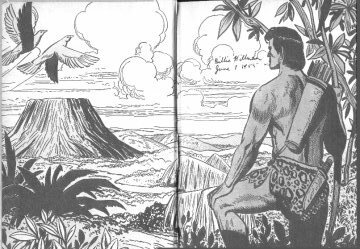 Tarzan agrees to accompany Atan Thone to Ashair to find Helen’s brother. It is only then that Thone starts to believe that Tarzan is not Brian Gregory. Warned by a scream, they all turn to see the witch doctor about to throw a spear into the hated Wolf’s back. A jungle hurricane wrecks the encampment of the Tarzan-Gregory safari. While the storm rages, the bearers desert and attach themselves to Atan Thone. Thone plies the natives with liquor and incites them to attack the Tarzan party. During the attack, Lal Taask and Gregory are killed. Because of Helen and Magra, Tarzan agrees to a truce. Atan Thone demands the map of Ashair and finds it on Wolf. A warning cry from D’Arnot draws the attention of the group to Wolf. Behind him, spear poised, ready to hurl it into his back crouches Ambooli, the witch doctor. Tarzan leaps in and grasps the spear from mid-air. Atan Thone is further convinced that this man is a jungle ape-man and not Brian Gregory. Thone suggests that they join forces under Tarzan’s leadership to carry on to Ashair and they embark together at dawn. Dawn – sudden, brilliant and hot – finds the long queue of the safari safely across the river with Larson again breaking trail. As they plunge into the shadowy depths the sun beats diagonally into the purple mists of the jungle, spilling vague blue shadows along the forest paths. D’Arnot expresses amazement at the efficiency with which Tarzan has organized the now combined Gregory-Thone safari. Tarzan emphasizes to Thone that natives will work much better if treated with kindness. Conversation turns to D’Arnot’s and Helen’s now very visible fondness for one another and Magra’s scare from a hippo during the morning’s river crossing. D’Arnot confides to Helen that he has buried her father’s body under a cairn on a hilltop. Thone talks to Tarzan about the difficulties he, Magra and Brian Gregory’s safari experienced on their way to Ashair last year. At camp that night Helen disappears and D’Arnot runs unarmed into the jungle to find her. Atan Thone’s little safari are now a part of the Tarzan-Gregory expedition. Thone has agreed to proceed with Tarzan and his friends to Tuen Baka under the leadership of the ape-man - a forbidden city of Ashair being their goal. Thone is after the Father of Diamonds, the talismatic gem of the Heriharians while Tarzan and his companion hope to find Helen Gregory’s brother, Brian. Helen mysteriously vanishes from the midst of the encamped safari and without pausing to pick up a weapon. D’Arnot rushes blindly out into the black jungle night in search of her. Tarzan races after D’Arnot who has frantically gone in search of the disappeared Helen. The rest of the party gathers around the campfire where Atan Thone wonders if Helen has wandered off or has been kidnapped. Tarzan returns with D’Arnot, gives orders for the safari to carry on, and leaves alone in search of Helen. The safari carries on for days – all but D’Arnot giving up hope that Helen will be found alive. Atan Thone observes that the circumstances surrounding Helen’s mysterious disappearance are identical to those associated with her brother’s disappearance a year ago. The natives make a great commotion and Ambooli repeats that Larson has disappeared into the ground while leading the safari. Larson calls to them from the bottom of a hole. He asks for a flare and directs them to a stone stairway which they follow to descend into the hole. They find themselves in an ancient, ventilated, man-made causeway. Their torch reveals Egyptian hieroglyphics on the stone walls. Incredibly, they discover mixed in with the Egyptian writing are words in English.